Future of jobs - how it will affect us and what are the best ways to prepare for the unknown? No one can tell for sure, and this is why we are opening a series of events, "Tech Espresso" disruptive morning meet-ups to explore the world of automation and together look for ways how to be part of the change. At the first event of morning event series “Tech Espresso” we′ll be discussing such topics as - how the development of technology is already affecting different industries in Latvia and how professionals from various fields can prepare themselves for upcoming changes in the labor market. The first guest of morning talks “Tech Espresso” is going to be Pavel Kovalevich who is the co-founder of start-up Juro – contract management tool that offers companies more effective and convenient way how to integrate, discuss, sign and learn from legal contracts. 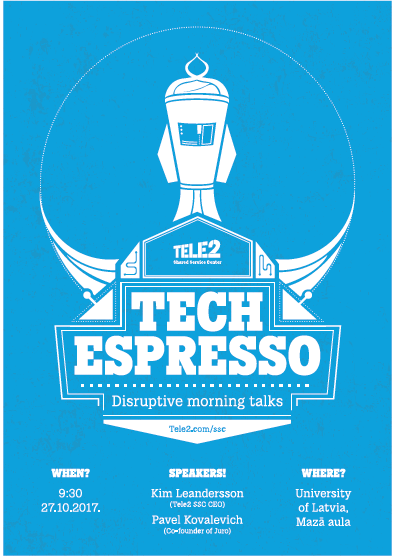 Morning talks are organized by Tele2 Shared Service Center (Tele2 SSC) and University of Latvia. The discussion will be held in English while enjoying an informal atmosphere, coffee, and snacks.